I had spied these patterns on a few blogs and on etsy, and finally buckled down and bought a couple. I'm not against commercial patterns per se, it's just that I went to school and learned how to make my own patterns and feel that I really should put my education to use. But then I thought about how much time and effort it would take to even draft a pattern like this, let alone sew a mock up before sewing the real deal...yeah...purchasing the actual pattern is definitely worth it! 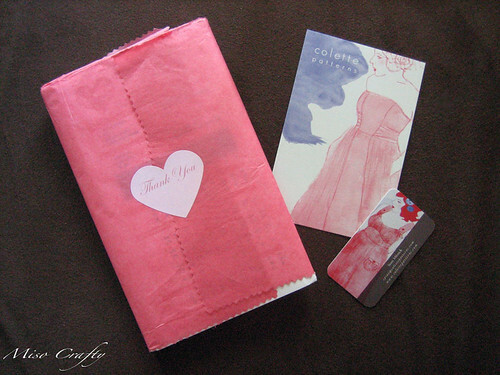 And just look at how it was shipped to me and how the pattern is packaged! I'm such a sucker for good packaging. 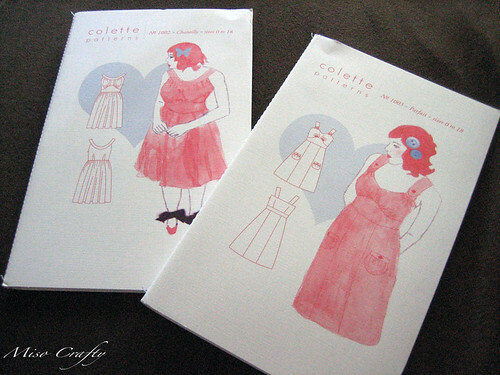 I bought 2 patterns - both dresses, the Parfait and the Chantilly. I'm hoping to make Parfait soon and am happy to have found some fabric in my stash to make it with. I was really hoping to be able to sew up Chantilly for the winter holidays cause I think with the right fabric it would make for a very lovely party dress. I take the fabric recommendations on patterns into consideration but rarely follow them to a T, but I think with the Chantilly you really should go with what is suggested since the design is so light and flow-y and the fabric should be as well. But I'm having a really hard time finding cotton lawn or even double gauze fabric anywhere here in Victoria - and don't even get me started on Fabricland either. I swear, the criteria to work there you must have crappy customer service, a severe hatred of your job, a lack of motivation to even do your job, and a gift for making the customers feel like they are wasting your time. Oh Fabricana, why must you be so far away??? I've tried online too, but have failed at finding anything that didn't have a print. Although, I was lusting after some yummy Nani Iro fabric, but that's just too far out of my budget at the moment. 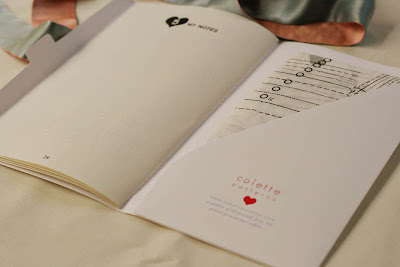 I had checked out the Colette blog too and saw that the designer had made an absolutely gorgeous variation of the Parfait dress into a retro shorts playsuit! I just might have to do that too! And lucky for me, there was also a tutorial on how to adjust the pattern for the smaller busted gal. I wonder if I can make another deal with Brett? Sewing time for a round of 18-hole golf? What golf loving guy would turn down the opportunity to play golf?? Hmm...note to self: must talk to Brett when he gets home from work.